On January 16, a suicide bombing in the northern Syrian city of Manbij killed at least 19 people, including four American military personnel. A week later, a bombing near the town of Shadadi targeted an American military patrol; thankfully, the patrol suffered no casualties. Islamic State has claimed responsibility for both attacks. These terrorist attacks carry added significance because they follow closely on the heels of President Donald Trump’s unexpected announcement that he would order a withdrawal of American troops from Syria. Defense Secretary Jim Mattis, long considered a source of stability in the current administration, resigned in protest over Trump’s decision. The proposed withdrawal has also been met with criticism from across the partisan aisle. Yet despite Trump’s apparently haphazard approach, a troop withdrawal need not be a victory for America’s enemies. America has mostly achieved its objectives and reducing the chances of superpower conflict is a worthwhile cause. When the Syrian Civil War broke out in 2011, Congress rejected President Barack Obama’s request to use military force to depose Syrian dictator Bashar al-Assad. However, the emergence of Islamic State would throw a wrench into the works. Islamic State took advantage of power vacuums in Syria and Iraq to claim territory and declare its caliphate, a unique existential threat to other nations. Islamic State changed the calculus enough that in 2014, Obama authorized air strikes in Syria and a limited deployment of ground troops. Operations against Islamic State have been successful, as the caliphate now controls only two villages in Syria. Yet the American entrance into Syria opened the door for further involvement outside of action against Islamic State. Under Trump, the U.S. would become a deliberate direct combatant against Assad’s forces, attacking Shayrat Airbase in retaliation for a chemical attack carried out by Syrian government forces three days prior. This set a precedent for numerous strikes by the U.S. against the Syrian military, which happened concurrently with the Russian military engaging in strikes against rebel forces. Despite their caution, it was inevitable that the close proximity of U.S. and Russian forces would cause them to come into contact. It is reported that hundreds of Russian mercenaries were killed in American airstrikes against pro-Assad forces, who were assaulting an outpost containing rebel and American soldiers. Russian officials have claimed the Russians involved were mercenaries unconnected to official Russian forces, but this is unlikely. Russia is known to employ a hybrid warfare strategy which includes maintaining distance from military assets in order to avoid culpability. The Kremlin has been linked to mercenary forces, such as the Wagner Group, which it uses when it desires plausible deniability. This practice is useful especially when considering the current example, where deniability prevented further escalation with the U.S. While Moscow and Washington were successful in burying this single known incident, they are playing an incredibly dangerous game by deploying forces in such close proximity. The same could be said regarding Iran’s presence in Syria. The U.S. and Israel have endeavored to counter Iran’s influence, and it has long been known that Israel has engaged in multiple strikes against Iranian military targets in Syria. However, until recently Israel refused to acknowledge the strikes, using denial to prevent further escalation with Iran. This changed over the past month, when Israel admitted to attacking Iranian forces in retaliation for Iran firing missiles into the Golan Heights. Given Iran’s expressed desire to destroy Israel, it is rational that Israel has been active in denying Iran a military presence on Israel’s border. Yet Iran’s belligerent rhetoric regarding Israel is also why a shift to acknowledgement of strikes is so foolish. Iranian leaders will now be hard pressed to ignore Israeli attacks, and will face mounting pressure to retaliate given their previous statements. An Israel-Iran flashpoint is one of the greatest threats for broader conflict across the Middle East, especially given Israel’s ties to the U.S. Proxy conflict by any of the aforementioned nations carries massive risk, which the benefits of engagement in Syria do not repay. It is at this point which Trump finds himself deciding to end American direct involvement in Syria. Opponents of troop withdrawal argue that an American presence helps the fight against terror, increases the chances of Assad’s downfall, and improves America and its allies’ balance of power against Iran. While Islamic State’s defeat was the mission’s original stated goal, when the group has nearly lost all of its former territory it is hard to see what purpose direct troop involvement serves. The presence of American troops is often a provocation for terrorist attacks rather than aiding in their prevention. Stopping lone attackers from decentralized terrorist organizations is more the purview of intelligence services. Additionally, Assad appears entrenched to the point that regime change, even if it were wise, is impractical without direct war between American and Russian forces. Opposing Assad is the correct moral position, but as seen in cases such as Afghanistan, Iraq, and Libya, removing one evil is likely to bring evil even greater still. America is also still capable of deterring Assad’s atrocities from a distance, as seen by missile strikes on chemical weapons stores. While these strikes have not entirely ceased horrors carried out in Syria, they are likely to have shifted the situation compared to if the strikes had not occurred. As for Iran, America should stand behind limited Israeli strikes on Iranian forces, but the priority should be towards de-escalation rather than increased conflict. A war with Iran would be disastrous. If the Iraq War went poorly, consider that Iran is four times the size of Iraq with twice the population. Despite frankly insane rhetoric, Iranian leadership has also shown a willingness to be rational and negotiate, as evidenced by the nuclear deal struck under the Obama administration. The U.S. should avoid locking Iran into a position that it cannot back down from, and removing troops from close proximity to Iranian forces is a smart way in which to prevent a worst case scenario. Advocates of a continued American troop presence had a legitimate point when it appeared that Trump would withdraw troops abruptly. However, National Security Advisor John Bolton has since clarified that the pullout will be gradual, as well as conditional on no reemergence of Islamic State and no aggression towards the Kurdish people by Turkey. The last point is key – Kurdish troops were supported by the U.S. to do the majority of the ground work in the fight against Islamic State. 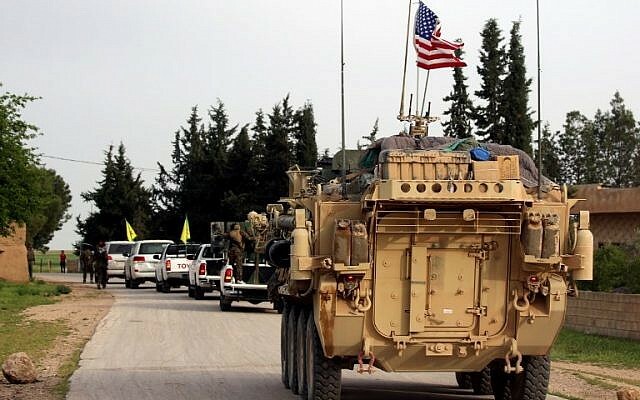 Turkey considers Turkish Kurds to be terrorists set on secession, and Syrian Kurds to be in support of secession efforts; hence, an American presence has been a deterrent to Turkish action against the Kurds. If the U.S. cannot effectively guarantee the Kurds’ safety after a troop pullout, the Kurds may have no choice but to turn to Assad for protection. An abandonment of the Kurds would also set terrible precedent for foreign groups that the U.S. wishes to collaborate with moving forward. While Turkish President Recep Tayyip Erdogan has said that Turkey will not compromise on this issue, there are other routes the U.S. can consider other than indefinite troop deployments alongside the Kurds. Trump has threatened to “devastate Turkey economically if they hit Kurds,” and the considerable weight that American economic sanctions carry make this a threat that Turkish leadership cannot afford to ignore. With all these points in consideration, it appears rather conclusive that a gradual withdrawal of American troops from Syria is the best option for America’s interests. It also should be cheered by the world, as it massively reduces the likelihood of an accidental superpower conflict sparked between the U.S. and Russia. While not always the case, sometimes doing less really can be doing more.